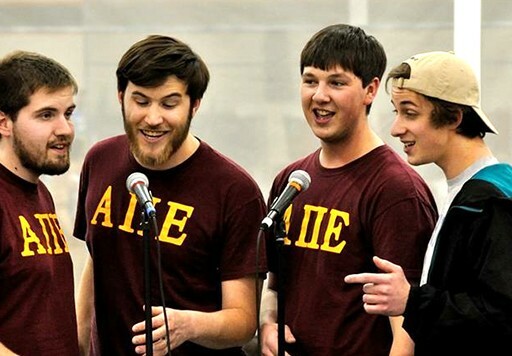 Sam Rickert '15 (second from right) sings with his barbershop quartet Whirlwind. Sam Rickert '15 always knew he wanted to go to Doane. His family, most of whom went Doane, might have disowned him if he didn’t, he joked. His grandparents even worked at Doane—his grandpa was once the head of the education department and his grandma was an elementary music professor and both eventually worked in the Office of Institutional Advancement. “I grew up running the halls of Padour Walker,” Rickert said. But the family connection isn’t the only reason he chose Doane. He knew that there was no place better, at least for him, because of the education Doane offers. As a music education major, Rickert is able to graduate in four years, whereas if he attended most universities, he said he would've had to stay longer. Rickert has always been interested in music, growing up around it. His dad was a longtime band director and his mom always joked that during children’s choir, Rickert was the loudest. That’s why Rickert is not only a music education major, but involved in the Symphonic Wind Ensemble, Doane Choir, Jazz Unlimited and Double Wide, a male acappella group on campus. He also started a barbershop quartet, Whirlwind, which he is particularly proud of. Whirlwind Barbershop Quartet from Doane University on Vimeo. His older brother started a barbershop quartet while he attended Doane, and Rickert would come to his performances. The group is run completely by student. Led by Rickert, Whirldwind has had the opportunity to perform on campus and at several competitions. Rickert also works for the admissions department, is a member of Alpha Pi Epsilon fraternity and part of several honor societies. His ability to be involved in so much, leading to strong connections across campus, is another aspect he loves about Doane. “There’s just a different aura here than most places,” he said. “There’s this cohesiveness across campus. This place strives to the best and it has produced a lot of great people for the world. Rickert is glad that he has taken classes outside his major—even science, which he's not so fond of—because he said he knows will benefit him in the long run. “I might not need those classes to be successful in my career, but I need them to be successful as a person,” he said. Rickert has several career paths he’s considered after graduation. He's interested in higher education, whether that be as a music professor or working in student leadership or admissions. He has also considered working with barbershop music professionally. But no matter where he ends up, he said he was proud to have attended Doane.